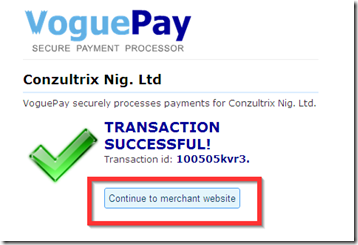 Bank payments from our Nigerian clients are now processed using an e-payment platform called VoguePay. Its very easy, all you have to do is open a free online account with them and fund it by paying or transferring into their account. This is the same company that helps us to process our ATM and credit card payments (click here for a tutorial on how to pay online with a Nigerian ATM card). With this new bank payment method, you can transfer money from any Nigerian bank to make payment for our products, or you may go physically to any Guaranty Trust Bank (GTBank) branch and make a cash deposit there. This method is meant for people who are having problems with the ATM method or who do not want to use their ATM card online. In the following short tutorial, you will learn how to pay for e-books and other products on NG44.com through the bank via VoguePay. It is very easy and you can get your e-book or product to download in 48 to 72 hours or less (no more 9 days). To make your payment through the bank, you need to first register for a free online account with VoguePay. This online account, also known as an e-wallet can be loaded with naira by paying (or transferring) into VoguePay’s Nigerian GTBank account. Opening a VoguePay account takes less than two minutes and will be explained later on in this short tutorial. When you fund your account with the required amount of money, you will be able to make payment with your now loaded VoguePay wallet and get access to your purchased product immediately. If it is a downloadable product, you will be able to download it instantly. Below is a shortened list of all the steps to take for this method. Below the list are the detailed explanations for each step. 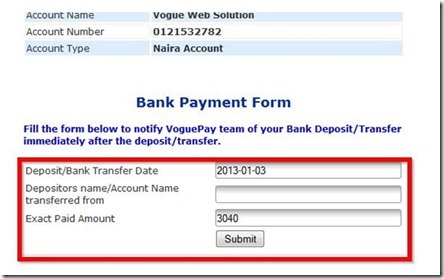 Log in to your VoguePay account and notify VoguePay of your deposit/transfer. It takes 24 to 48 hours for your account to be credited after notifying them (this does not include weekends). Now we shall look at each step in detail. If this is your first time using this method, you should pay close attention to the steps below and if possible print out this page. You can use the print button at the end of the tutorial to print it out. When you create an account with VoguePay, you will get access to your personal online wallet which is like an account that you can load with naira through the bank and then use to make payments on NG44 and any other website that accepts VoguePay. You can open a free account right now. To open your free account, visit vp.ng44.com or click here (To reduce delays, please make sure that you use either of these two links to register: www.vp.ng44.com or click here ). If you already have a VoguePay account no need to open another one. Just skip Step 1 and move on to Step 2. Account Type: Click the blank box and select Personal from the drop down list. Your username should contain only alphabets and numbers. It must not contain spaces and other characters. (Tip: Try to select a username that it not too long). Next, enter the Password that you want to use for logging in to your wallet, enter it again for confirmation, then type in your email address. Fill in your real name and surname then your phone number. Start the phone number with 234 and remove the first 0 in the actual number. For example, if you are from Nigeria and your phone number is 080346894374, enter it as 23480346894374. Fill the rest of the form with the correct answers. Click to select your State. For Date of Birth, the format is YYYY-MM-DD which means Year as four digits, Month as two digits and Day also as two digits. For example, if you were born on 6th March 1982, you will write this as 1982-03-06 and if you were born on 9th November 1987, you will write this as 1987-11-09. At the end, accept the VoguePay terms and conditions by clicking the check box. Finally, enter the verification code that you see into the box specified. If you are unable to see what is written, you can generate another code by clicking on the blue circular arrows to the right of the code. Then click on Register. If you made any mistakes, you will be notified. If nothing happens after clicking the form, check to see whether there are any mistakes. Correct these mistakes and click register again. If successful, you will see a notification pop up. Click outside the box to close the pop up. Make sure you keep your username and password safe so that you do not forget. An email will be sent to you containing a link that you are to click on so as to activate your new account. If you see a message like the one below, close your browser then open it again before going to your email. Now go to your email to check for the activation link. 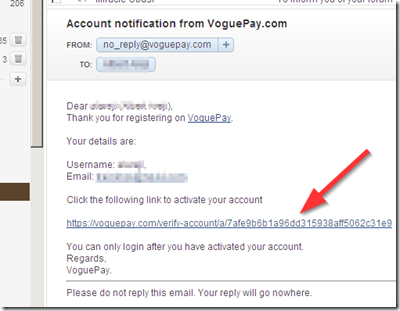 Check for an email from [email protected] with subject Account notification from VoguePay.com. If you do not get it immediately, wait for a few minutes and if you still cannot see it, check your spam mail. On successful activation, a popup notification appears. 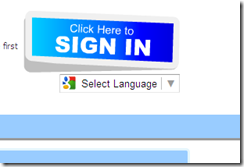 As before, click outside the box and if you are not already logged in automatically, click on the Sign In link or button. To the right of the Sign In box are some helpful links and answers to the questions that you might have. Go through each of these links to learn more about VoguePay or about the section of the website that you are in. If your login is successful, you will be granted access to your control panel (also known as dashboard) from where you can manage your account and load money into your e-wallet. On the top right hand corner of the dashboard, you will see the current amount of money in your account. Anytime you fund your account, you will be able to see the new balance reflected here as soon as it is credited. If after logging in you see any of the following “Invalid account” messages, you have to close your browser then reopen it and try logging in again. Now that you have successfully created a VoguePay account, the next step is to load it with funds. To load money into your online wallet, you need to pay money into VoguePay’s bank account and then notify them of the payment. Within 24 to 48 hours your account will be credited (weekends not counted). You can either transfer the money online into their account or go physically to any branch of GTBank and make a cash deposit. As mentioned above, after paying to their account, you are to login to your dashboard and notify them. This process will be explained in greater detail in Step 3. When your wallet has been credited, you will be able to make your payments on NG44 and get access to your purchase immediately. Although opening a VoguePay Personal account is free, you will be charged a very small fee anytime you wish to fund your account. For bank funding, this fee is about 1.01% of the amount that you are loading. To find out how much loading fee you are to pay for any amount, login to your account and under Transactions click on Fund Account. 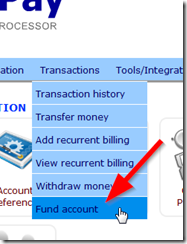 You can also click on the Fund Account icon as indicated by the red box in the picture below. On the next page, enter the amount that you want to load into your account. Take note that the amount you enter does not include the fees. What you enter here will be the exact amount that will be credited to your account. It is based on what you enter here that your 1.01% fee will be calculated. Only numbers should be entered here. Don’t add comma or full stop. Write 3000 and not 3,000. If you get the error popup shown in the following picture, remove anything that is not a number and try again. 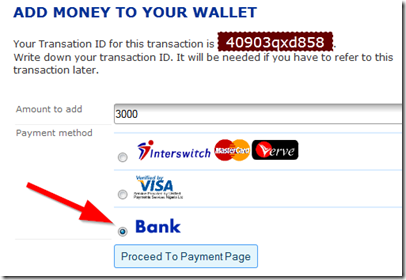 Now, select Bank option and Click on Proceed to Payment Page. In the next screen, the 1.01 % loading fee will be calculated and displayed under bank charge and below it the total amount that you are expected to pay or transfer to VoguePay’s account. Sometimes the Total amount may have decimal places, always try to round up the figure to the nearest 10, 20 or 50 when you are paying especially if you are going to the bank physically. But if you are transferring through online banking, you could easily transfer the exact sum with the decimal places if you so wish. 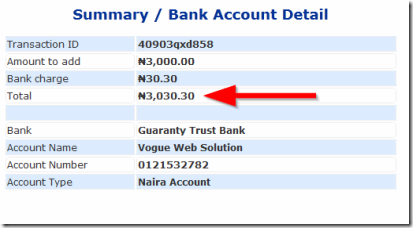 For instance, in the example below, the Total to be paid to the bank is N3,030.30. In this case if you are going to the bank physically, you could round it up and deposit N3,040 or N3,050 to their account. To avoid delays, it is better to overpay than underpay. In most such cases, the extra amount is also compensated for when your wallet is being credited. When you have figured out the total figure you are expected to pay for the amount that you want to load, copy the VoguePay account as displayed below the total and go to any of the branches of the listed banks to make a cash deposit or enter your online banking panel and make the transfer. 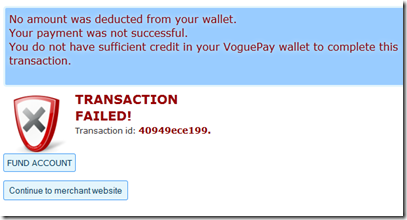 If you are not making the payment immediately, you can log out of your VoguePay account at this point. 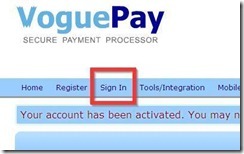 After making the payment, you will be able to log back in and notify VoguePay as described in the next step (3). 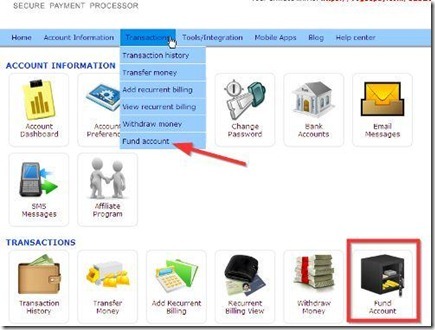 Repeat the process described in Step 2 which is to to place your mouse over Transactions in the top menu and then click on Fund Account from the drop down that appears. On the next screen (and just as described in the previous Step 2), enter the amount that you want to load (minus the fees), select bank payment and then click on Proceed to Payment. Fill the Bank Payment Form with the details of the payment that you made. Crosscheck to make sure that there are no mistakes in the information that you enter and then click on Submit. On successful submission, a message will popup telling you that the submission was successful. 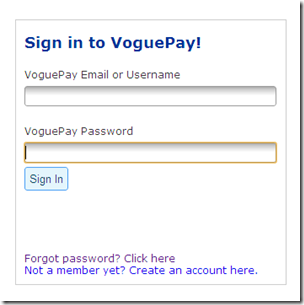 Click anywhere outside the box to close it and then log out of your VoguePay account. It takes 24 to 48 hours for the deposit to be reflected in your wallet so you have to wait. Saturdays and Sundays are not counted among. After filling the form, your wallet will be credited within 48 hours and an email sent to you. If there is any problem with your payment, you will also be notified. When you get the notice that your wallet has been loaded, Sign in to your account and check your balance which is displayed on the top right hand corner of the page. By now you should be able to see the correct amount reflected in your wallet. Having confirmed that your account has been credited, you are now ready to pay for the product on NG44 and download it instantly without any further delay. Now that your VoguePay online wallet has been funded, it is now time to pay for the actual product that you want to buy from NG44. To pay, visit the payment page for the product and click on the red Make Payment button under Method 2: Bank Deposit or Transfer. Confirm that the details of the order are correct then enter your VoguePay username and password and click on Make Payment. If all goes well, you will see the payment success message as shown below. Click on Continue to merchant website and follow the instructions on the page to access your download. If you do not have sufficient funds in your account or there is some other error while processing your payment, you will see the Transaction Failed message together with the reasons why the transaction was not successful. If the above steps are not clear to you or you are encountering difficulty with the payment process. You can get help by contacting our Customer Care Desk. can’t we arrange 4 one on one seminar.atlist see u in person.hav fallen victim al d time.i’m tired of scan.then i can buy any ebook u want me 2.
which l will deposit the money to my wallet throught the bank, my question now is what will l write inside the bank teller where the ask for depositors name plseae help me. what if l used my visa card throught my ipin, if l change my normal pin to ipin can l still used my card with the normal pin or is the card remain only for online use. waiting for your comment urgently. Please call customer service between 9 am and 6 pm on 08187131717 to get directions on what to do. Pls I want to buy ur tutorial ebook. Does the ebook contain the steps on how I can things with the little computer knowledge I have, and can I use a modem 4 my internet connection.